Owing to the fact that the pressure switch is a ubiquitous device, found regularly in every plant, the need to always calibrate the switch is always there. We have discussed how to calibrate and adjust a pressure switch in a previous post, but I do so again, this time using a Fluke pressure calibrator which is a very handy and popular device used by instrument technicians and experts. Because of the fact that the pressure switch may be pressurized while in service, the first step in calibrating a switch in service is to first depressurize and isolate the pressure switch from the process. Position your Fluke device and make the connections as illustrated in the diagram above. 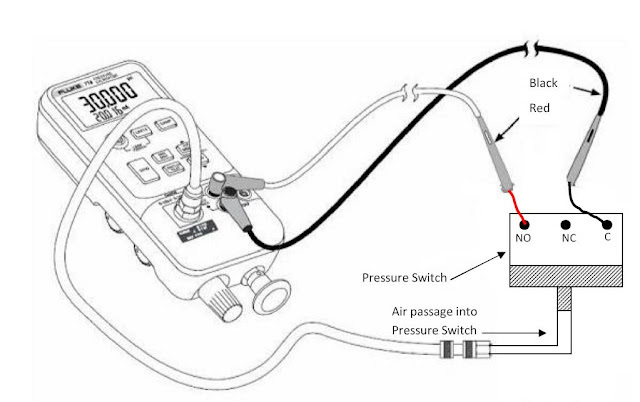 Notice that the connection above implies that the internal pump of the Fluke device is being used. If the pressure range is beyond that of the internal pump of the device, an external pump module may be required. Consequently there may be a need for an isolating valve on the air or gas passage line. Put on the Fluke device and open the vent valve. Press the Zero button to clear the zero offset. Close the vent. Press the Switch Test button to enter the switch test mode. Apply pressure slowly with the hand pump until you approach the setpoint. Using the fine adjust knob on the Fluke device, adjust the pressure until the switch opens and OPEN is displayed on your Fluke instrument. Release the pressure slowly using the fine adjust knob until RCL is displayed. Press the Switch Test button once to read the pressure values for switch opening and again to see the pressure at switch closing. Adjust the pressure switch setpoint until the switch contacts open and close at the desired pressure.